Obtaining good bass performance from small speaker boxes has always been the 'holy grail' of loudspeaker design. Typically a small box will have less bass performance than a larger one. 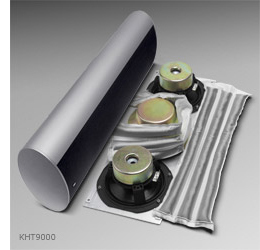 However, after years of research KEF has overcome this problem with the development of Acoustic Compliance Enhancement (ACE), where activated charcoal, just like in a water filter, is placed inside the loudspeaker cabinet. Tiny holes in the porous ACE material act like the small air sacks in a lung by absorbing and giving out air molecules as the drive unit moves in and out. This helps the bass driver 'breathe' more easily allowing improved bass performance. In fact, a speaker using ACE technology can have the same bass performance as a conventional speaker of twice the size. ACE technology allows us to circumvent these basic restrictions and gain the freedom to adjust the 'effective' internal volume by filling the enclosure with activated carbon. ACE works by a process called adsorption - the highly porous carbon granules take in or give out air molecules in response to the change in air pressure caused by the inward and outward movement of the speaker cone. This flow of air molecules is always acting to reduce the internal pressure variations - making the enclosure appear to be much larger than it actually is. The more activated carbon we put into an enclosure the bigger the effective internal volume becomes - up to a point where losses start to dominate. Typically, we can double the internal volume whilst still maintaining a high quality bass roll-off characteristic. Using ACE to reduce the enclosure volume whilst maintaining the same bass response. The first public demonstration of ACE was based on the RDM monitor - the ACE loaded version maintained the same bass performance with 40% less volume. The volume increase can be utilised in two main ways: (1) reducing the size of a particular speaker while keeping the performance the same or (2) increasing the bass extension from a given speaker whilst keeping the size the same. In general, it's a bit of both as we will custom design the bass driver for each application and look for the best overall compromise. In sound quality terms ACE has some major advantages - principally that it allows us to design a speaker with the bass extension of a reflex system but with the superior transient response of a closed box. In addition to the measurable parameters, the sound quality of ACE enclosures is consistently well liked by audiophiles, with a precise and detailed bass reproduction.